The fundamental laws of the universe create recipes for how particles combine to create other particles. Why not make these recipes a step more literal and make cocktails based on the laws of physics? A kind of “Quantum Mixology”. 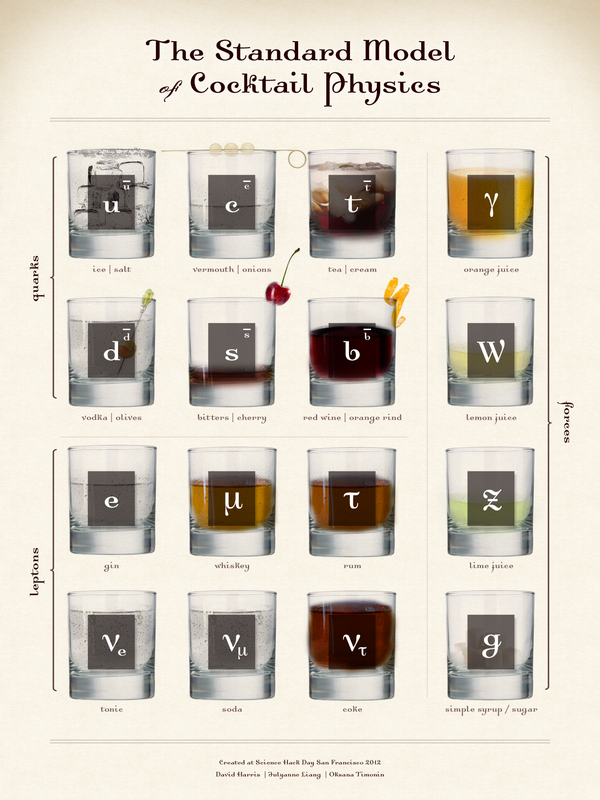 Each fundamental particle is mapped onto a cocktail ingredient, whether a liquor, a mixer, or a garnish. Then compound particles, which consist of combinations of fundamental particles, have a recipe for a cocktail built in. We have matched cocktail ingredients to fundamental particles in a way that the properties of the particles match the properties of the ingredients as much as possible. For example, the electron and the electron neutrino are often found together in particle decays so those two particles map on to gin and tonic respectively. In addition the neutrinos are much lighter particles so they correspond to the mixers rather than the alcohols. A wealth of choices like that underlie the mapping from fundamental particles to cocktail ingredients. The cocktails are presented as a set of recipes, defined by compound particles, but we have also done a back translation and adapted classic cocktails to a quantum theme, identifying these new recipes by their particle ingredients. The translation from particles to ingredients is presented in a poster showing “The Standard Model of Cocktail Physics”. The recipes are also available through a website that does the translations of particles into ingredients for you. David Harris, Julyanne Liang, Matt Bellis, Moon Limb, Morris Mwanga, Oksana Timonin, and Yevgeny Binder. For physicists: You can generate a cocktail from any Feynman diagram so try your hand at seeing what a beta decay is, for example. I really need this in painting form for my bar. Oil, acrylics or water color.